Welcome to the world of three-wheeling. Our Introduction to 3-Wheel Riding Course is designed for those new to three-wheeling. Riders with three-wheel experience will sharpen their skills and reinforce the special techniques needed to navigate in real-world traffic. JOIN THE ADVENTURE OF THE OPEN ROAD! Develop the skills necessary for touring on a three-wheeler. In many states, including California, you can legally ride a three-wheeled motorcycle with a Class C driver’s license. 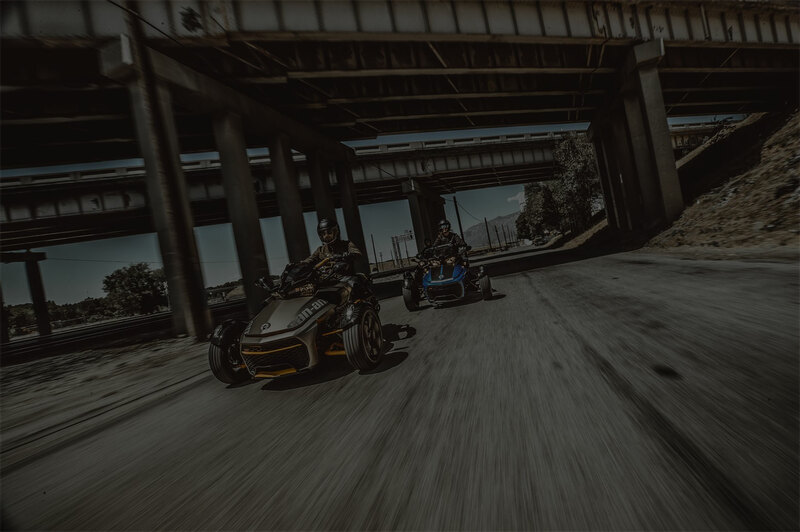 However, whether you’re new to motorcycling or new to trikes, you’ll need a special skill set that doesn’t directly translate from two- or four-wheeled vehicles. You’ll learn basic control: clutch/throttle, straight line riding, stopping, turning and shifting, as well as techniques for maneuvering on three wheels and finding a safe way through traffic. Experienced two-wheel riders will focus on behavioral changes such as transitioning from counter steer-and-lean to direct steering; avoiding the habit of putting a foot down for balance; and using the hand brake. Class size is limited to 12 per session, so you’ll always get the personal attention you need. Here you’ll learn basic control: clutch/throttle, straight line riding, stopping, turning and shifting, as well as techniques for maneuvering on three wheels, finding a safe way through traffic, and avoiding obstacles. We provide helmets and Can-Am Spyder three-wheelers; or you may use your own DOT-approved helmet. The Introduction 3-Wheel Riding Course is a 4 hour course. You may participate in riding sessions ONLY with proper protective riding gear. Helmet: Provided. Alternately, you may bring your own DOT-approved helmet (full-face recommended). Eye Protection: Three-quarter helmets (without face shield) require prescription glasses, goggles, or sunglasses. Boots: Sturdy over-the-ankle boots or high-top shoes that cover the ankle. Gloves: Full-fingered motorcycle-specific gloves. No fingerless, motocross or mechanics’ gloves. Jacket: Long-sleeved, made of sturdy fabric; motorcycle-specific jacket with armor recommended. Pants: Kevlar jeans, jeans, chaps, racing leathers or textile. No “fashion” jeans, flares or holes, please. Invite a friend into the tribe! Purchase a gift certificate for the Basic California Motorcycle Safety Program course or SRT Intermediate course and spread the love of safe and savvy motorcycling.